The 2018 inflation factor is 1.02389. (2/5/19)–The alternative standards for episodic waste generation regulations are found in R315-262-232 of the Utah Admin. Code. These regulations allow a very small or small quantity generator to have one planned or unplanned event each calendar year without increasing their generator category as long as they meet the standards. Information regarding notification and management of episodic waste are outlined in our fact sheet (715 KB). (1/11/19)–Scott Anderson retired as Director of the Division of Waste Management and Radiation Control after 38 years of dedicated service to the State of Utah. He began his career as an environmental scientist in 1980. Scott was great at finding workable solutions when complicated rules impact Utah businesses, ensuring that businesses prospered while achieving compliance. 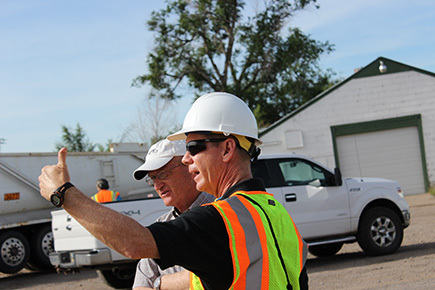 Just prior to retirement, Scott was actively involved with development of new solid waste disposal fees that will impact over 250 facilities. Scott worked hard to ensure all impacted facilities had a voice and were treated fairly. Scott served as Director for the Division of Solid and Hazardous Waste from 2010 to 2015 and continued on as Director when the Division was combined with Radiation Control creating the Division of Waste Management and Radiation Control. Rusty Lundberg has been appointed to serve as Interim Director of the Division. A template is now available for those needing to prepare an environmental covenant acceptable to the Director of the Division of Waste Management and Radiation Control. The template can be accessed by opening the Forms menu in the WMRC Links menu on the left. Click on General in the Forms menu and you will be taken to the list of General Forms. Clicking on Template for Environmental Covenant will open a Word format document that you can use as the template for your environmental covenant. The Waste Management and Radiation Control Board reviewed a request by EnergySolutions, LLC for an exemption from the rule that requires EnergySolutions to prepare a performance assessment that demonstrates the proposed disposal of depleted uranium would meet the performance standards required by the rules. At a meeting of the the Board on October 25, 2018, the Board made the decision to deny the exemption request. See the Order from the Board denying the request (133.18 KB) for more information. EPA is establishing a national system for tracking hazardous waste shipments electronically. This system, known as “e-Manifest,” will modernize the nation’s cradle-to-grave hazardous waste tracking process while saving valuable time, resources, and dollars for industry and states. EPA anticipates launching e-Manifest on June 30, 2018. Visit the e-Manifest page to sign up for email updates, find out about testing, and much more. All large quantity hazardous waste generators and treatment, storage, and disposal facilities in the State are required to submit a hazardous waste generation and management report to the Division every even year by March 1. See the Biennial Hazardous Waste Report page for more information. Submit your RCRA Subtitle C 8700-12 forms electronically. No more printing, signing, or mailing. Enter and submit your data on-line, and receive an email notification when your data has been accepted. Renewal of 11e. (2) Byproduct Radioactive Material License (RML UT1900479) and the Groundwater Quality Discharge Permit (Permit UGW370004) for the White Mesa Uranium Mill site near Blanding, San Juan County, Utah. Certain counties have collection events where residents can drop off household hazardous waste. See the recycling information for Utah to find out if your county is having an event. Safeguarding and improving Utah’s air, land and water through balanced regulation.